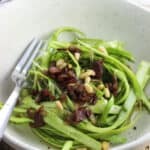 Shaved asparagus with bacon vinaigrette is a hearty side dish made with tender, crisp asparagus sections and a warm bacon dressing. It’s a different, delicious way to use this spring seasonal vegetable. Rinse and shave asparagus using a vegetable peeler. See note below on shaving tips. Place four strips of bacon next to one another in a skillet, then place skillet on the stovetop set over low heat. Once the edges of the bacon strips begin to curl, flip strips over and cook on the other side for several minutes, or until browned and beginning to crisp. Remove strips from the skillet and place on a paper towel-lined plate to drain. Pour the drippings into a small bowl. Once the bacon slices have cooled, crumble bacon. Pour 2 tbsp of the drippings and 1 tbsp of the olive oil into the skillet and set it over medium heat. Once heated, add chopped onion and minced garlic. Move onion and garlic around the skillet and cook until onion is golden, 3-4 minutes. Once golden, remove skillet from heat. Add remaining 1 tbsp olive oil, balsamic vinegar, honey, and hot sauce and whisk to combine. Add crumbled bacon to the skillet and stir. Season to taste with salt and pepper. Place skillet back on the stovetop over low heat for a few minutes to thicken slightly, or to your liking. To serve, portion out shaved asparagus and pour warm bacon vinaigrette over top. Sprinkle pine nuts over top, if you like. To make shaving the asparagus easier, you can place each stalk on the handle of a wooden utensil lengthwise so that it's raised up off the cutting board. Then run your vegetable peeler down the length of the stalk and place the shavings in a bowl.